"What's New In Angular 6?" "5 Reasons Why React Native Is The Best Hybrid App Development Framework"
MongoDB - a schema-less (document-oriented) NoSQL database which provides high performance, high availability and easy scalability. In today’s dynamic world, everyone hails for scalability, flexibility, and efficiency in developing complex web application. So, a rapid application prototype with a super-flexible design which can restyle according to the changing requirements become a key requirement for the web application development. And this necessitates a software stack called MEAN Stack, which gives the required power and fluidity to the developer to assume a flexible, locally owned schema, in-built support for an end to end testability and the utilization of open source repository of re-usable plugins for quick iterations. Another interesting feature of MEAN stack that makes it irresistible is its compatibility. It’s a perfect framework compatible with every operating system running under Node.JS, which includes MAC OS, MS Windows, and Linux. Mean also includes a non-relational database named MongoDB in its stack, which executes queries quite easily without making any complex allocation for information exchange and maintenance. This works in a way akin to OOPs, hence the system retrieve result quite swiftly and efficiently and also perform regular functions in a faster way. How Will MEAN Stack Add Value To Your Business? If your goal is to leverage high-performing, scalable, and agile business application that not only promotes your business products or services but leverage customers with the swift result and best user experience, MEAN Stack will be the best option to go with. MEAN Stack To Carry Out Smoother Experience! 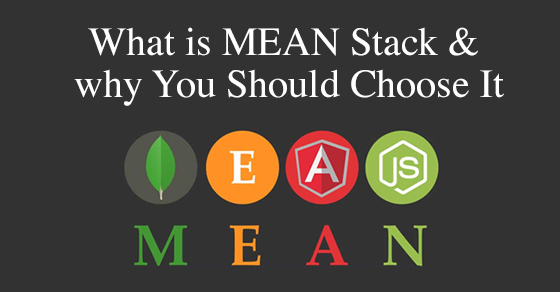 MEAN Stack is an up to the mark approach to web development. And it is gaining strong traction in the market, so definitely it will be a great choice to empower your next web application project. Almost all the 4 technologies MEAN stack holds ensures that you join your hands with reliable and efficient technology partner for your web application development. Further, MEAN stack can help you in accelerating the workflow and thereby, boost customer satisfaction along with the business growth.In short, the technologies in MEAN are well executed and are ready to handle the challenges every business face.